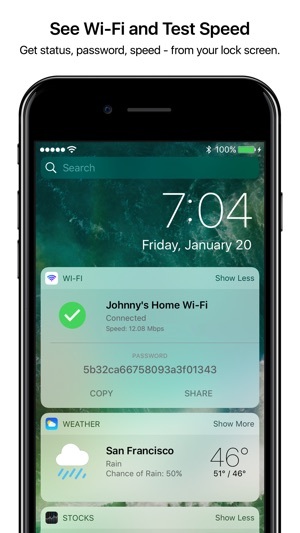 Save time and be protected with the fastest way to test, share, and secure your wi-fi, without even unlocking your iPhone. MACSTORIES ***** "Why hasn’t this been done before?" LIFEHACKER ***** "Wi-Fi Widget does what it’s supposed to do well." "No more waiting around for a page to load, then seeing a minute later that I'm on some random router named 'NETGEAR' with no internet. " "A single tap to share my wifi network and password with a colleague visiting my home. From the lock screen!" 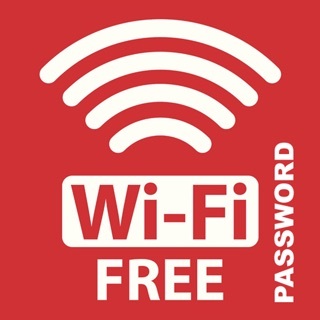 Wi-Fi passwords are synced securely and privately through iCloud Keychain, so only you have access. Put Wi-Fi Widget on your home screen for even faster access to your wi-fi summary and password sharing. Secure your browsing against snoopers, public wifi hotspots, and even your ISP. 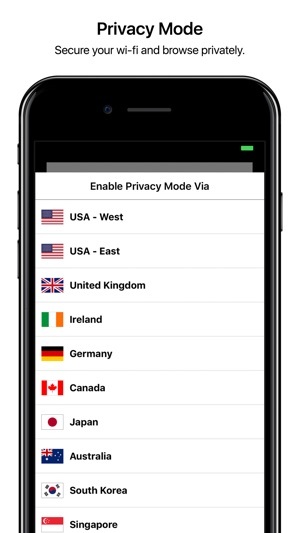 Get anonymized through 11 countries. "How fast is my wifi? I get it by tapping the widget to get results in megabytes per second. It couldn't be easier." 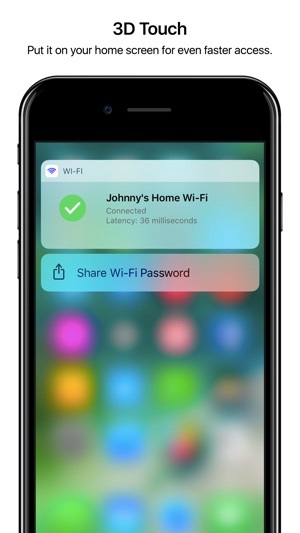 Since Wi-Fi Widget is accessible even from the lock screen, it's the fastest possible way to see, test, and share your wifi. 1) "Why Google is taking so long to load??" - WITHOUT: You seethe with anger and wonder how long you should wait until you throw your phone against the wall. - WITH: Swipe down to Today and Wi-Fi Widget shows you you’re connected to some random router named “NETGEAR” with no internet. 2) Your friend comes over and asks, “what’s the wi-fi here?”. - WITHOUT: Find that scrap of paper somewhere with the 20 character long random string, dictate it multiple times to your friend and screwing up because “sorry, M, not N… and it’s all capitalized… wait start over… okay never mind I don’t really need the internet here." 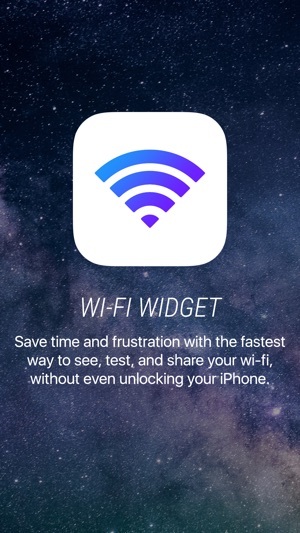 - WITH: Swipe right from the lock screen and tap “Share” on Wi-Fi Widget. - WITHOUT: You’re like, “ARGH, NEVER AGAIN, COMCAST…"
Why fight your wi-fi? Get the widget that saves you time and frustration. 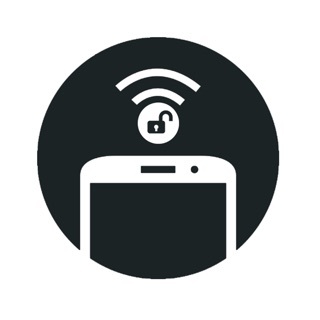 Wifi Widget contains a Pro Privacy service for our VPN service. 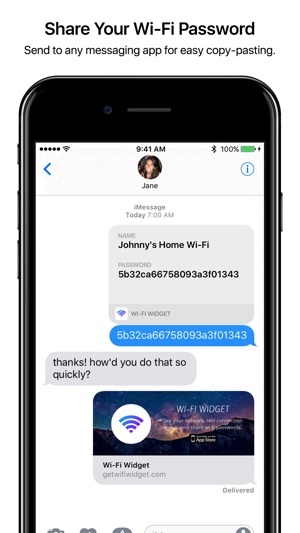 Wifi Widget Pro subscriptions have a free one week trial, after which you will be charged to your credit card through your iTunes account. Price may vary by location. Your subscription will automatically renew unless canceled at least 24 hours before the end of the current period. You will not be able to cancel the subscription once activated. Manage Wifi Widget Pro Privacy in Account Settings after the optional upgrade. I really liked this app before it was slightly changed. It no longer opens my settings if I tap the widget and that was very convenient when I needed to switch from one channel to another in my home. It’s still nice to have but that was my main reason for using it. Is there a way to set this option again? I’d give it 5 stars but that one little change is kind of frustrating. Thanks! The widget is a quick way to see what network you're on and it worked so well I chose to purchase the pro upgrade to get the testing abilities. This is a little inconvenient to use because it only provides either latency or speed from the widget. In order to get both, you have to open the app and use the menu to select the other test. It would be nice if the test just showed the results of both latency and speed tests simultaneously on the widget. I frequently switch from one WIFI to another in my work environment and this app helps me to see immediately what WIFI I am on and lets me quickly switch to a better one. I use it on my phone and iPad and they work seamlessly together. It is handy that they "talk" to each other and share information.